Scientific Games' Next Generation of Lottery Instant Games, HD Games™, Launches Successfully in U.S.
LAS VEGAS and ATLANTA, Jan. 4, 2018 /PRNewswire/ -- Scientific Games Corporation (NASDAQ: SGMS) ("Scientific Games" or the "Company") today announced that HD Games, a new, proprietary line of instant games have launched and are performing well in a number of U.S. states. Innovated by the Company to serve today's highly visual consumer, HD Games combine sharp, high-resolution imaging with larger contemporary play symbols, premium paper stock, enhanced security and other upgraded features that elevate the player's lottery instant game experience. In 1974, Scientific Games developed the world's first secure lottery instant game and is the world's largest provider of instant games. "Scientific Games congratulates the Ohio Lottery, Washington's Lottery and Montana Lottery on their successful launch of this next generation of instant games for the enhanced enjoyment of players in their states," said John Schulz, Senior Vice President, Instant Products at Scientific Games. "HD Games products are selling very well, and we are excited to introduce this new, engaging product line to our lottery customers and their players worldwide." The Ohio Lottery tested HD Games products with Cashing Thru the Snow, a $2 holiday game launched in October 2017. "Cashing Thru the Snow is already outperforming all $2 holiday games that have launched over the last three years," said Ron Fornaro, Instant Ticket Product Manager for the Ohio Lottery Commission. "We pride ourselves in offering an innovative collection of holiday games for Ohio players every year, and our trial of the new HD Games product line with a holiday specialty game was a hit." 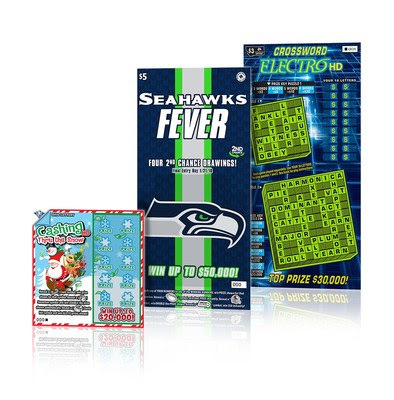 Washington's Lottery was seeking a new innovation for its SEATTLE SEAHAWKS® branded instant games and opted to launch the $5 Seahawks Fever game as an HD Games product this year. "Our SEATTLE SEAHAWKS games have always performed well, and we wanted to take that success to the next level," said Gaylene Gray, Instant Product Manager for Washington's Lottery. "We've had requests from players and retailers to make every game an HD Game." The Montana Lottery just launched the new product as a $3 crossword game, Crossword Electro HD. "The Montana Lottery has always had a great portfolio of crossword games that appeal to our demographic of more mature players, and HD Gamesproducts are a natural progression for this portfolio," said Jay Boughn, Instant Products Manager for the Montana Lottery. "HD Games feature a crystal clear font over our classic crossword games and offers our players great readability – perfect for crossword play styles." Schulz said the Company's patent-pending line of HD Games products are produced with enhanced game security features and significantly increased dots per image (DPI) in a complex printing process to create a higher-resolution clarity not offered by any other lottery instant game supplier to date. Highly-detailed play symbols are applied on layers of inks recently developed by Scientific Games' technologists. The Company has also added strength to the retailer ticket authentication process using its new SecurTag™ security coating beneath the scratch-off coating. This new secret coating is completely invisible to the naked eye, but is easily identifiable when viewed through a special viewing device. All of the technology and inks behind the HD Games product line were developed over the last several years at Scientific Games' global lottery headquarters just north of Atlanta, the largest of the Company's five instant game manufacturing facilities worldwide.